Our fourth year was a tremendous success! There were 170 participants out there who braved the chill and covered 1596.8 miles. Collectively, in our three hour event, you all ran/walked 1596.8 miles. That’s over 500 miles an hour!!! And if we had been on a plane together we would have flown from R. B. Winter State Park to Denver, Colorado! We also had 42 Virtual Participants in twenty different states plus one who ran in Canada. I am completely blown away! You are all amazing. Last Friday night I was able to donate $6000 to this year’s beneficiary! ADERS, or Autism Diagnostic Evaluations Resources Services, Inc., is a 501c3 nonprofit located in Montandon, PA whose mission is to be able to provide comprehensive autism services from diagnosis across the lifespan. They have several ambitious projects on the horizon, including renovations to a newly acquired large meeting space (which have begun! ), a pilot social skills program for elementary kids, a day habilitation program, professional trainings, and much needed social events for people who are affected by ASD (they have an event coming up next month!) Please check out and ‘like’ their Facebook page. As usual, I’d like to share some of my favorite comments from this year’s participants. “I wanted to say thank you so much for organizing such an awesome event for a great cause. This race was so much fun! The energy facilitated by the dedicated runners and organizers would make anyone hyped up enough to run for 3 hours. It was so encouraging and exciting to see so many people come together to promote physical activity and autism awareness. This is a very unique combination! The positive energy and determination of the runners and volunteers was super motivating and inspiring. It made the weather conditions more tolerable!! I can’t wait for next year!” Arielle W.
“Thanks for a great race this past weekend! And congrats to all the participants who toughed it out on a very chilly day! Funny how a 1.6 mile loop can fly by, and before you know…you’ve run 20 miles!” Kelly H.
“I loved it!! 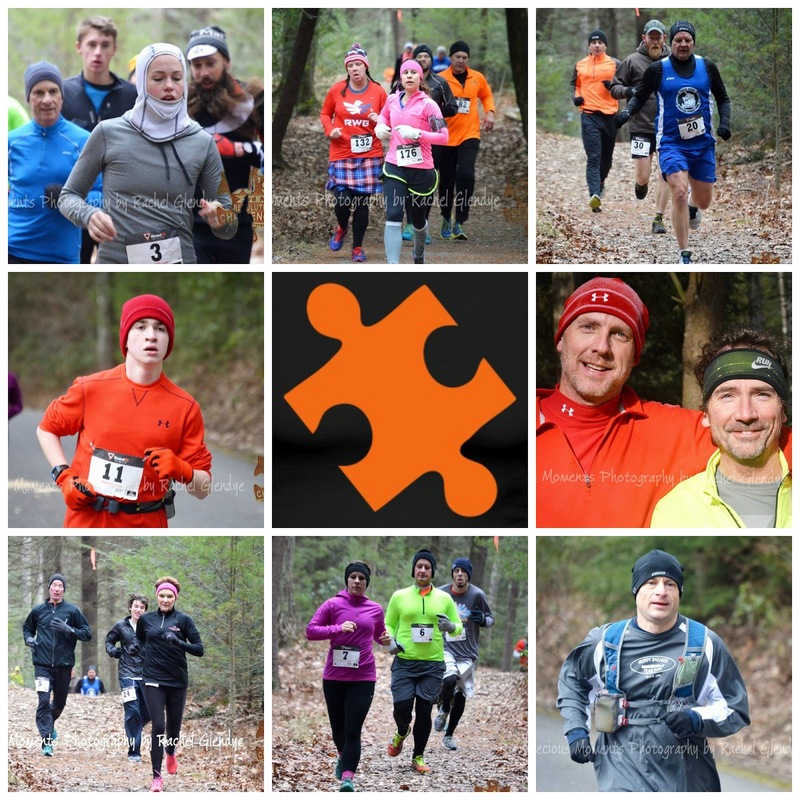 What a fun event…even in the cold!!! I’ve never been to a race that is designed for the casual exerciser and the competitive runner! It was neat to see so many doing what works for them!! And it was my first trail “jog” in the snow!!! Whether it is about resolving the challenges of autism or about your personal resolutions for the new year (or both)…don’t miss this run next year!!! The food was free, the music was fun, the course is flat, the PEOPLE were fantastic, the fire was warm, the T is a keeper, and the cause is meaningful!!! Thanks so much to everyone that came. You would love this race because you can go farther or stop early, take a break and go again…it was fun! 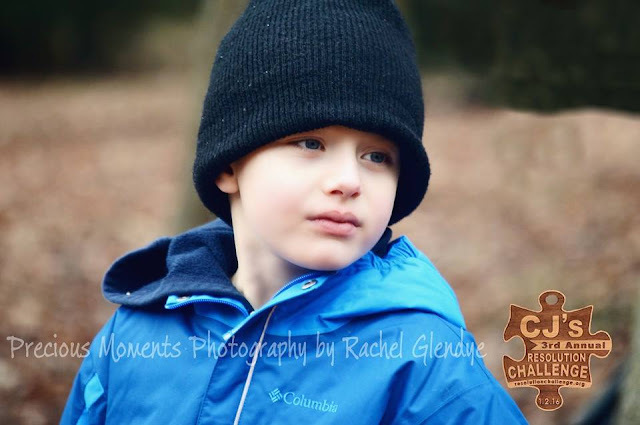 !” Christy R.
“Year four of CJ’s Challenge to benefit Autism charities. Collin and I have run every year. We love this three hour challenge on the trails at RB Winter State Park. The temp at the start of the race was a balmy 15′ degrees which was warm compared to the -8 our first year when Collin was only 11! Thank you for organizing this race and choosing a cause that is near and dear to my heart. See you in 2018!” Tracy W.
“One of my favorite running events provided over 9.5 miles of icy trails and frigid temperatures but the people at this event have the biggest hearts and are so supportive! Happy to have spent the morning with many friendly faces raising money to support local autism charities! Great job as usual putting on a fantastic event!” Michele B. Feedback like that helps keep us going. I thank you all for your kind words. Also, a special thank you to the Mifflinburg Community Ambulance Company for being available to come to our aid as needed. Thank you to Charlie for taking photos throughout the day. Thank you to all the volunteers who arrived early and stayed late to ensure a great event. Thank you A.W. Entertainment for the music- we loved it! Thank you to our Super Soup Ladies- that soup was oh so yummy and oh so necessary! An event like this simply could not be put together by a single person. I could never say the words “thank you” enough to express how much gratitude I have for each and every one of you who helps make this race happen. To my friends and family, runners, spectators, and volunteers who have for four years now, voluntarily froze beside me on the mountain, you believe that this is more than just a race. You understand that we do this to honor my son, to shine a light on autism, to have the conversations that make an impact, to connect someone to the resources they may need, and to build a network of support that could last lifetimes. And yes, we have a ton of fun, but surely, this is more than just a race. The third race has come and gone and seems to be an annual favorite among area runners. I thought it would be fun to present a recap in a “CJ’s-By-The-Numbers” format. So here ya go! 47 – number of virtual runners who came from…..
21 – different states, and……. 3 – other countries- the UK, Tanzania, and Antarctica! 8700 – dollars raised to benefit the Northeast Bradford Elementary School Life Skills Classroom, a class in rural Pennsylvania that serves children with autism, Down’s syndrome, intellectual disabilities, and multiple disabilities. 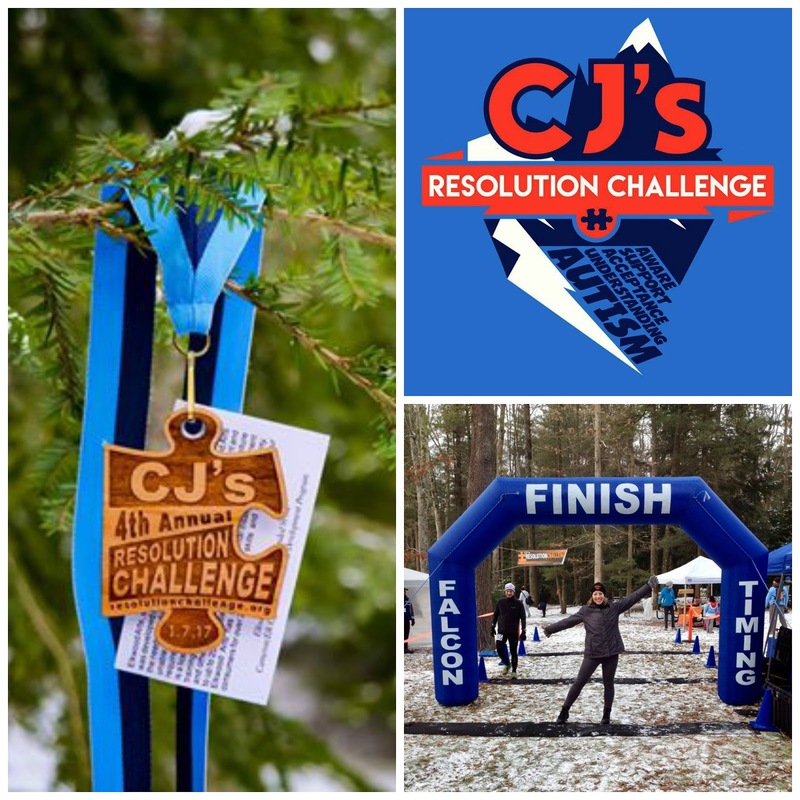 “Thank you CJ’s Resolution Challenge for a perfect race. I could not think of any way that this race could improve! 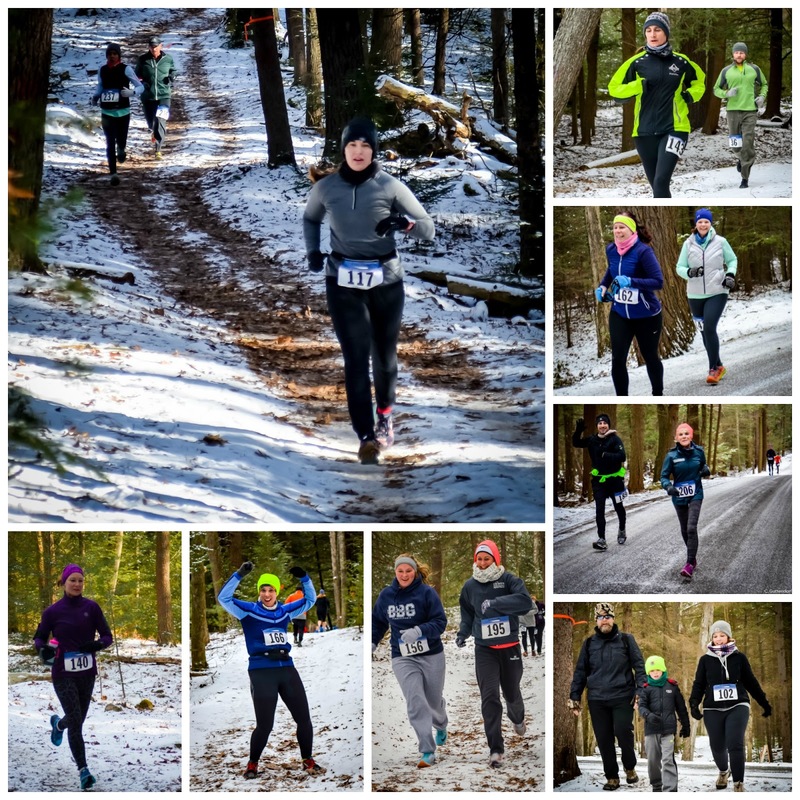 Easy registration, indoor restrooms before the race, a beautiful course – half trails, half road – lots of friendly people to talk to on the course, tons of fueling options, great music blasting at the finish/start line, and yummy hot soup and home made goodies for after the run. What could be better? I will definitely be back, and I hope to be able to bring some southern PA friends to the 2017 race!” Laurie H.
“Great time today… So positive. Loved the course with beautiful trails and road combo. Soup, homemade cookies, etc. perfect and delicious. Ran 13 miles today – a personal best for me – something I never thought I could accomplish. Looking forward to the 2017 event! Thank you for all the hard work that went into creating an extraordinarily positive experience.” Jeff R.
“As any of my running group can tell you, “I HATE TRAIL RACES”. That being said, this morning’s race was fantastic – the perfect combination of trails and road. I was looking forward to it all month. I ran it the first year and had a blast but missed last year due to an injury. I can’t tell you how disappointed I was. It was great to be back, and the weather was about perfect for a January race. Thanks to all of the organizers and volunteers for a well done event.” Tom C.
“Thanks Janell and volunteers for a fun and unique event! The trail was beautiful and I loved the smell of pine through the woods. Race directing is a ton of work and you all did a great job. Shirts were great as was all the support. Will be back. Thanks!” Marjorie L.
An event like this cannot be pulled together alone. I’d like to offer my deepest, heartfelt thanks to everyone who has a hand in this race. I could not (repeat, could not!) do it without you. To my family and friends who for three events have frozen on the mountain by my side, you believe that this is more than just a race. You understand that this is to honor my son, to shine a light on autism, to have the conversations that make an impact, to connect someone to the resources they may need, and to build a network of support that could last lifetimes. Surely, it’s more than just a race. The race grew quite a bit this year from 77 participants in 2014 to 124 this year. Enough growth that we’ll be working with Integrity Sports (PA Runners) to chip time our 2016 race! We also added a virtual option for out-of-towners that had 43 participants across 15 different states plus Germany! We raised over $8300 to support the Operation Jack Autism Foundation and Geisinger’s Autism & Developmental Medicine Institute. I feel we got great positive feedback and encouragement to keep coming back. Below are my favorite comments. Sean M. – Awesome job by everyone involved with CJ’s Resolution Challenge today…especially the hardy volunteers who stood out in the beautiful weather all day! Can’t wait until next year! Great seeing familiar faces today! First class event, first class volunteers, and first class soup! Eve-Marie – This was awesome . The sleet added to the fun. Friendly runners and volunteers. The course was wonderful. Could not have asked for a better outcome to event. The fire and hot soup was a plus. 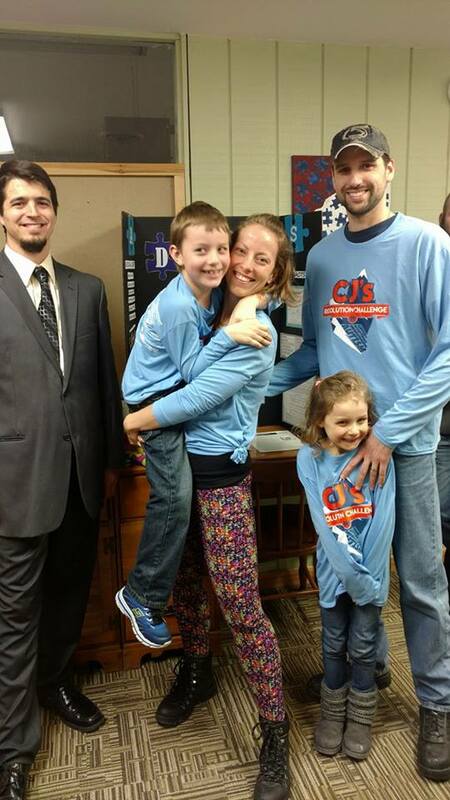 Chris V. – Great race for an awesome cause. Highly recommend it, and will definitely do it again. Janine G. – Really fun format, great food. Really enjoyed this race the last two years. The format allows for a wide range of participation, and is also a great way to get in some long training miles in safety and relative comfort given the typical weather in January. Carla C. – This was so much fun! The weather was a challenge but it added to the adventure. Great event! Darcy I. – Great event ! 1st year I did Last Man Standing. 2nd year RC Revolutions. Both times I had a blast. Can’t wait for the 3rd one !!! Jay M. – Had a great time at this event. Original, challenging, well supported and all for a great cause! As the race director, I work really hard to make my vision of this event a reality. So comments like these make me so happy that I could burst! I think the race format is great, I’ve called it customize-able because it truly is. If participants want to walk a lap and then hang out by the fire they are welcome to do so. If you want to come and run hard for over twenty miles, you are welcome to do that too! I think the fundraising is going well with lots of room to grow. And the autism awareness part of the event became a little more evident this year with representatives from not only ADMI and Operation Jack, but also ASERT Autism Resources and Verbal Beginnings, LLC. I am overjoyed with this year’s event and I am just so grateful to every single person who came to participate, who helped me spread the word, who stressed out with me during planning, who happily volunteered to cook, play music, or volunteer in anyway. It takes so many people playing so many different roles to bring it together and I could never do it without you. Special thanks to the Mid Penn Trailblazers, PA Runners, Nittany Valley Running Club, Penn-York Valley Running Club, Team Taper, and Team RWB for their support of this race and for spreading the word. 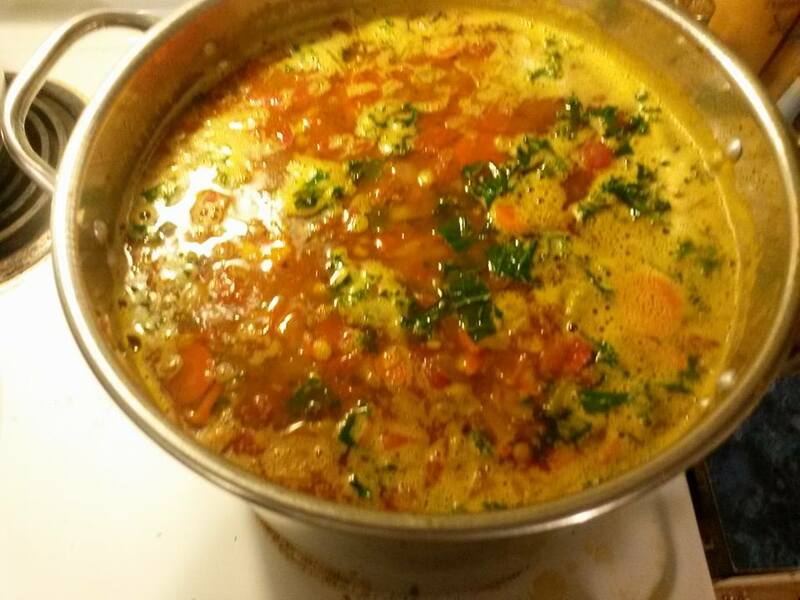 Thanks to Dee and Ruth for the delicious soup. Thanks to Kevin and Brandi for the use of their heaters and generator. Thank you to the Steve and the Bucknell Crew team for lending their tent. Thanks to Corey for making some really nice signs for the event. Thanks to everyone who donated and bid for our basket auction. Thanks to all our sponsors, especially Inside Track– Lewisburg, Blaise Alexander Ford, Boop’s Welding, Chicadee Hand Crafted Jewelry, and Andre from A. W. Entertainment. Thank you to Sam for your unending support of this race and for believing in it before I did. Thank you to Megan and Dr. Challman for supporting the race and for representing ADMI. Thanks to Erin for being present for Cullen and sharing what ABA Therapy is all about. Thanks to Megan from ASERT Autism Resources for sharing what’s available in PA for those affected by autism. And thank you to my mom, my right hand through it all. I love putting on this race, and I hope to do it for many years. Finally. 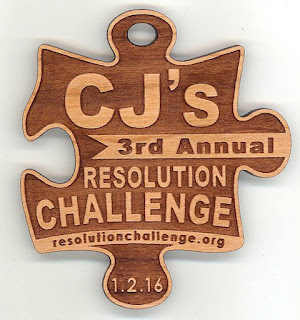 The post about CJ’s Inaugural Resolution Challenge. For those of you not in the know, this was a fundraising event that was first dreamed up back in September, but didn’t take on the form of a race until October. It was a lot of work, but it was well worth all the effort. So, after two and a half months of a lot (a lot, a lot) of planning and organizing, CJ’s Inaugural Resolution Challenge was held on Saturday, January 4th, 2014 at R. B. Winter State Park, Mifflinburg, PA. My best friends Crystal and Joe came to stay at our house as well as my Power Strangers teammates Jamie and Mike. I was so glad to have them here, because this group of people have run enough races that I knew their expertise would be priceless to me. We marked the course and hung tarps on the pavilion on Friday. It was bitterly cold and there was some fresh snow on the ground, but the freeze was really beautiful. We had 66 people pre-registered for the race, and ended up with 77. Some were registered for RC Revolutions, a three hour event in which participants aim to complete as many laps of the 1.6 mile course as possible. Others chose the Last Man Standing. Held on the same course, this three hour event was formatted much differently. Participants ran timed laps that progressively got one minute faster than the one before it. We had prizes for the top three men and women in each event. Those who ran the most laps in RC Revolutions ended up running a little over 22 miles!!! And the top two runners in the Last Man Standing ran a total of 19.2 miles with their last lap being their fastest at a 6:19 pace!!! We got a lot of great feedback afterwards, below are my favorites! You heard them, they want more! And I intend to give it to them! 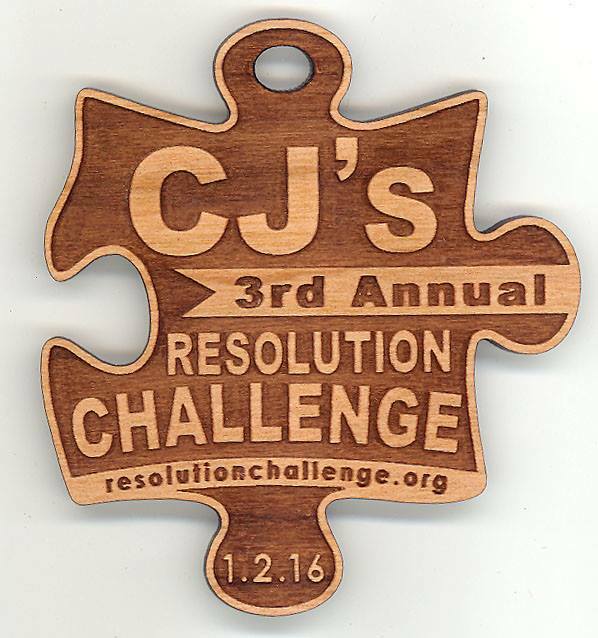 CJ’s Resolution Challenge will become an annual event that I hope will only continue to grow and evolve. Tentatively mark your calendars for the 2nd Annual CJ’s Resolution Challenge for January 3, 2015. I’ll do it as long as I can and as long as there is interest. But so far I haven’t mentioned the outcome of the fundraising side of all this. Was it successful? You bet it was! Through the sale of CJ Elephants, cash donations, basket raffle and race proceeds, we grossed nearly $10,500 for Operation Jack Autism Foundation and Geisinger’s Autism & Developmental Medicine Institute. In addition, we also received a $2000 donation for ADMI! A grand total close to $12,500 raised to fight autism. It was more than I could have dared to hope for. When I left the event site the day of the race, when everything was done, I just felt this overwhelming sense of gratitude. It was over. It was successful. I am still so grateful to everyone who helped in anyway, large or small. It all meant something to me. I’m grateful to my cousin Ange for being the first to sign up. I’m grateful to my mom and grandma for sewing over 280 elephants. I’m grateful for Sam from Operation Jack for the amount of time he spent helping me with all sorts of race details and for making the trip to be there on race day. I’m grateful for Megan, the community liaison from ADMI for bringing out information about autism. I’m grateful to the daycare staff from the Milton YMCA who care for my children as they would their own, and cared so much that they formed a team to race. I’m grateful to Ami G., CJ’s teacher, whose enthusiasm poured out to other parents. I’m grateful to Kristen B., another autism mom, who shared her story (and a few hugs and tears) with me. I’m grateful to the Mid Penn Trail Blazers, whose support really gave me flight. I’m grateful to my friend Kelli, whose birthday wish was for others to come race with her. I’m grateful to Amey J. for jumping in and helping with registration. I’m grateful for my sister Brandi and her boyfriend Kevin for doing some publicizing and making some awesome signs. I’m grateful to every single runner and walker who braved the arctic temperatures and for their enthusiasm through it all. There are so many people who deserve to be personally named that I know I’m forgetting. Please know how appreciative I am of your contributions. And mostly I’m just so grateful to God. He planted this idea and gave me faith. He inspired a lot of other people, and that gives me hope. Packet Pick-up- Race day registration and packet pick-up will begin at 7:30am. The races will start at 9am. Weather- It is still too soon to say with any certainty what kind of weather we will have that morning. However, I think its safe to assume that it will be cold. So please dress appropriately. A change (or two) of clothing might not be a bad idea. We will be hanging tarps on the side of the main pavilion and we will have some space heaters, but please keep in mind that this is an outdoor event, in January, in Pennsylvania. Dress warmly! Race Format- As you know there are two challenges taking place concurrently- RC Revolutions and the Last Man Standing. There will be prizes for the top three men and women in each category. It is important that if you have changed your mind about the challenge you wish to participate in that you let us know. Parking- There will be plenty of parking with signage and volunteers to direct you where to go. Silent Auction- There will be a silent auction going on during the race with some great stuff up for bids. Pictures and description of the items are on FaceBook. All proceeds to go to our autism charities. Grub- Included in your registration is a meal ticket, good for breakfast and lunch. What a deal, right?! Breakfast will be coffee or hot chocolate and donuts. Lunch is soup, bread, dessert, and a beverage. For those that are not registered, all items will be available for sale as well. All proceeds from the sale of food and drink also go to our autism charities. Cups and CJ’s Elephants- Also for sale will be CJ’s Resolution Challenge cups and CJ’s Elephants for Autism Awareness. The stuffed elephants are baby safe and totally adorable. The proceeds from the sale of cups and elephants will also go to our autism charities. Autism Charities- Just a reminder, this unique, fun event is benefiting two autism charities- Geisinger’s Autism & Developmental Medicine Institute and Operation Jack Autism Foundation. We are very fortunate to have representatives from ADMI as well as the founder of Operation Jack joining us that day! I’m looking forward to meeting everyone on the 4th! I’m hoping you’re looking forward to race day as much as I am! CJ developed “typically” until he was about one and a half. I think that was the first time I told his doctor that I was concerned about his speech. It wasn’t that he didn’t have any words, he did have a few, and he was able to get his point across other ways, such as gesturing. The doctor felt that his abilities were still within normal range. At our next routine well-baby check up I reiterated the same concerns, the doctor reiterated her feedback. I’d been told time and again “you can’t compare your kid with someone else’s” but how could I not when other children his age are speaking in phrases and he still used only a few words, not to mention the “squawking” and obvious frustration and quirks he would exhibit at times. We moved back home from North Carolina to Pennsylvania late in 2011. I again voiced my concern at the first visit he had with his new Pennsylvania doctor in 2012 and immediately was told about CSIU (Central Susquehanna Intermediate Unit). In no time we had someone to our home who agreed that CJ would benefit from speech therapy, and we discussed the possibility of autism and paths to diagnosis. Because of unfortunate timing, CJ had to wait until the fall to begin speech therapy, but in the meantime we made a move to our permanent home and set up yet again with a new doctor. We filled her in on what had taken place thus far and we asked about a referral to a neurodevelopmental pediatrician. I had heard the wait list was about a year, so I was not surprised when we got “kicked back” to pediatric neurology, a common occurrence when waiting to see the expert. We still had to wait a couple months to see the neurologist in January 2013. This doctor told us that CJ was not autistic, that he would classify him as PDD-NOS (pervasive developmental disorder- not otherwise specified), and that in a year’s time CJ would be just like all the other average kids. The diagnosis PDD-NOS was actually removed from the Diagnostic and Statistical Manual of Mental Disorders (DSM) Version 5 by the American Psychiatric Association (APA) in May 2013. I was frustrated because a diagnosis of PDD-NOS wasn’t going to open any more doors for us, and even though we had been getting speech therapy for CJ, it was only 1.5 hours a week, not nearly what he needed. We didn’t expect to be able to meet with a neurodevelopmental pediatrician until February 2014, but by some act of grace, we were seen a couple weeks before his 4th birthday in July 2013. This evaluation felt very different from the family doctors’ and the neurologist’s. This was much more in depth and they asked questions that no one else had asked before. Dr. Challman of the Gesinger-Bucknell Autism & Developmental Medicine Center finally handed down the diagnosis I always suspected, autism spectrum disorder. This official diagnosis does not change anything about who CJ is or my love and devotion to him. What this official diagnosis does is opens doors that were previously closed to CJ. He is now in a specialized classroom three days a week and will soon be evaluated to see about getting “wrap around” services to help reinforce language and behaviors for times he’s not in that classroom. We’ve already seen great progress! It makes me wonder how he would have progressed if we had gotten the ball rolling with all of this at age 1.5 instead of 4. That’s why Geisinger’s Autism & Developmental Medicine Institute is the recipient of half of the funds raised from CJ’s Resolution Challenge. I also think about how tough it was navigating all of that and how frustrating and lonely it was at times. That’s why Operation Jack Autism Foundation is the recipient of the other half of the funds raised. We need more support for families struggling with autism and we need more professionals trained in diagnosing and managing these disorders. CJ’s Resolution Challenge is one step forward in working to achieve those goals. Wouldn’t it be great if I could go to a big box store and pick up whatever was needed for CJ’s Resolution Challenge, throw it in my cart, check out, and head home with everything needed to make it a fun, safe, successful day?! Well here in Reality World it doesn’t work out that easily, but maybe YOU can help me out with that. Presenting the RC Wish List! Items for basket raffle- gift cards, hand made crafts, business gift baskets…. whatever! Think you could help? Contact us today!